The United States has a long history of regulating and managing immigration, dating back to the 1860s. The U.S. Congress — the legislative branch of the federal government of the United States — develops and passes legislation, which the president signs into law, and federal agencies (executive branch) implement legislation. The primary immigration law today is the Immigration and Nationality Act of 1952 (the INA). Most immigration-related legislation since then has amended various sections of the INA. Among the most significant pieces of immigration-related legislation over the last two decades are the Immigration Reform and Control Act of 1986 (IRCA), the Immigration Act of 1990, the Illegal Immigration Reform and Immigrant Responsibility Act of 1996 (IIRIRA), and the Uniting and Strengthening America by Providing Appropriate Tools Required to Intercept and Obstruct Terrorism Act of 2001 (USA-Patriot Act). Immigration legislation has also been embedded in other acts and bills. The REAL ID Act, which was passed as part of an emergency supplemental defense appropriation bill in 2005, includes provisions that bar undocumented immigrants from obtaining federally accepted drivers' licenses. Over the last few years, there have been significant organizational changes in the structure of the agencies that oversee immigrant-related functions in the United States. The most substantial reorganization came as the result of the Homeland Security Act signed by President George W. Bush in November 2002. According to this legislation, most of the policy and implementation functions of the former Immigration and Naturalization Service (INS), which was abolished in March 2003, landed within one of three bureaus of the newly created Department of Homeland Security (DHS). The act also reassigned some responsibilities for visa policy and procedures from the Department of State (DOS), which previously had de facto jurisdiction over the entire visa process. 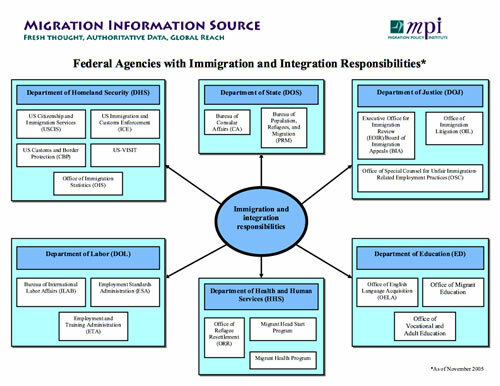 Nevertheless, as outlined below, a variety of other agencies have immigration-related functions, and some have immigrant integration-related responsibilities even though the United States has no formal integration policy or a dedicated agency for integration. Currently, no single agency or bureau develops immigration policy, coordinates the work, and assesses the effectiveness of various federal agencies in performing their immigration functions. The diagram below depicts federal agencies that are responsible for implementing, supporting, and enforcing the immigration and integration laws made by the legislative branch. Note: although these agencies have other functions as well, this Spotlight focuses only on those that relate to immigrants. U.S. Citizenship and Immigration Services (USCIS). USCIS is responsible for providing immigration-related services such as processing immigrant and nonimmigrant benefits; adjudicating refugee, asylee, and naturalization petitions; and granting or denying work authorization. U.S. Customs and Border Protection (CBP). CBP is charged with securing U.S. borders at and between ports of entry and facilitating legitimate trade and travel. It includes Border Patrol agents, as well as inspectors enforcing immigration, customs, and agriculture laws. U.S. Immigration and Customs Enforcement (ICE). ICE handles the interior investigative and enforcement responsibilities of immigration and customs, including detention and deportation. ICE focuses on national security, financial, and smuggling violations to target the support behind terrorist and criminal activities. US-VISIT. This is a stand-alone program office responsible for implementing the program that uses biometric indicators to track the entry and exit of nonimmigrant visa holders at U.S. air, land, and sea ports of entry. Office of Immigration Statistics (OIS). OIS is responsible for developing, analyzing, and disseminating immigration-related statistical information, including the annual Yearbook of Immigration Statistics. Bureau of Population, Refugees, and Migration (PRM). PRM is responsible for formulating policies on population, refugees, and migration, as well as administrating U.S. refugee assistance and admission programs. Bureau of Consular Affairs (CA): CA interprets visa laws and regulations and serves as a liaison between the Department of State and overseas embassies and consulates on visa matters. Oversight of visa policy now rests within DHS. Consular officials issue visas and passports and provide services to U.S. citizens abroad. Board of Immigration Appeals (BIA). BIA is the highest administrative body for interpreting and applying immigration laws. It has nationwide jurisdiction and is responsible for hearing appeals of decisions rendered by immigration judges or DHS district directors. Office of the Chief Immigration Judge (OCIJ). This office is responsible for conducting formal court proceedings related to immigration cases. Their decisions are final unless sent to BIA. Office of the Chief Administrative Hearing Officer (OCAHO). OCAHO oversees the administrative law judges who adjudicate employer sanctions, document fraud, and IRCA-related discrimination cases. Office of Immigration Litigation (OIL). This office holds jurisdiction over all civil immigration litigation and is responsible for coordinating immigration matters before the federal district courts and circuit court of appeals. Office of Special Counsel for Unfair Immigration-Related Employment Practices (OSC). OSC investigates and prosecutes employment discrimination based on citizenship status, national origin, document abuse, or retaliation. It also engages in outreach and education regarding employer sanctions' antidiscrimination provisions. Bureau of International Labor Affairs (ILAB). ILAB carries out DOL's international responsibilities by conducting research on economic, trade, immigration, and labor policies. Employment Standards Administration (ESA). ESA's Wage and Hour Division ensures compliance with minimum wage, overtime, and child protection laws; the Migrant and Seasonal Agricultural Worker Protection Act; and the protections of temporary worker programs. It also conducts inspections of I-9 forms. Employment and Training Administration (ETA). Prior to an employer petitioning USCIS for a foreign-born worker, ETA's Office of Foreign Labor Certification must first certify that requirements for that visa classification have been met, such as attempted recruitment of U.S. workers and payment of specified wage levels. Office of English Language Acquisition, Language Enhancement, and Academic Achievement for Limited English Proficient Students (OELA). OELA ensures that limited-English proficient children, including immigrants, attain English proficiency and meet the same standards as all other students. Office of Migrant Education. This office administers grant programs that provide academic and other services to the children of migrant workers whose parents work in the agricultural, fishing, and timber industries. Office of Vocational and Adult Education (OVAE). OVAE supports national research, evaluation, demonstration, technical assistance, and capacity building activities. Included in its program are adult literacy and the Center for Adult English Language Acquisition. Office of Refugee Resettlement (ORR). ORR provides funds to states, public and private entities, and nonprofit voluntary agencies to assist refugees and asylees in resettling in the United States and attaining self-sufficiency. The office also recently was tasked with overseeing the care of unaccompanied minors. Migrant Head Start Program. The migrant component of this national program modifies delivery to meet the unique needs of migrant farm-worker families. The program provides services to low-income, preschool-age children and their families. Its goals are related to education, health, parental involvement, and social services. Migrant Health Program. This program under the Health Resources and Services Administration provides grants to community nonprofit organizations for culturally and linguistically appropriate primary and preventive medical services for migrant and seasonal farm workers and their families. Deborah W. Meyers was formerly a Senior Policy Analyst at the Migration Policy Institute. Megan Davy is a former MPI intern. Solving the Unauthorized Migrant Problem: Proposed Legislation in the U.S.
"One Face at the Border" - Is It Working?